Here’s the first international release in nine years from Serbian composer-bandleader-saxophonist Boris Kovac. Kovac’s music, whether written for his small combos, for chamber orchestra, or to accompany theater or film, is tuneful, melancholy, and rich with the many cultural influences of Central Europe’s Pannonian Plain (everything from waltzes to Hungarian folk songs, plus a bit of Argentine tango for good measure). There’s no category for what Kovac is doing here – it’s too melodic and pretty to be jazz, too cool and stately for the dance floor, too urbane to be called folk, and far too intelligent for pop. But it has struck a nerve in certain circles – his 2001 disc The Last Balkan Tango was named one of Songlines magazine’s “50 essential albums,” and if you (like me) were wowed by that record and its two successors, this one will be right up your alley. 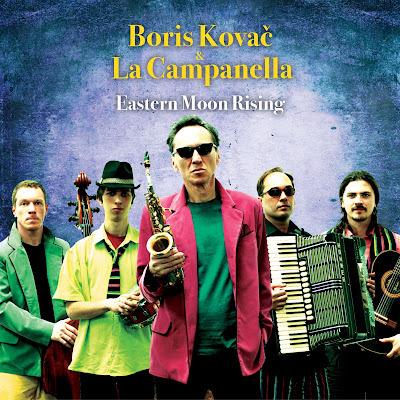 Kovac fronts the band with his wistful alto saxophone playing, Goran Penic’s accordion provides the harmonic center, and the guitar-bass violin-drums rhythm section adds essential twists and turns. It may be mellow, but it isn’t background music – listen closer, there’s a lot to hear here.